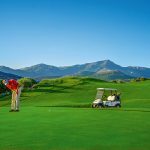 When choosing a golf holiday we highly recommend Crete as an ideal destination for all things Golf related. 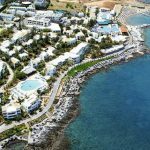 There are actually 2 golf courses in Crete but the main public golf course is the Hersonissos Crete Club. 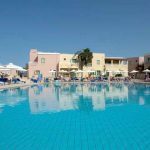 This is by far the more popular choice of destination and offers spectacular views over the rugged landscape of Crete. 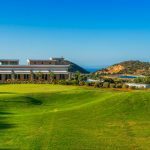 If you want to play golf in Crete then choose Crete Club, it is more for the experienced amateur golfer and you need a handicap of at least 28 for men and 36 for women to play on this wonderful course. The facilities on the course are top notch with buggy and club hire and an excellent bar, club house and restaurant. 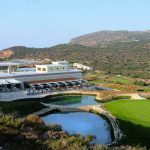 The Crete Golf Club is home to the first 18-hole course on the island and it is a lay-out that few visitors will ever forget. 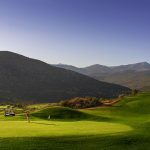 Course architect, Bob Hunt, has taken what was once an unkempt piece of rugged mountainside and transformed it into a verdant oasis surrounded by some of the most beautiful views in the whole of Europe. 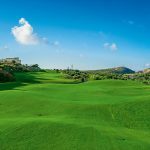 The course itself is best described as a desert-style lay-out, featuring expansive fairways hewn through rocks and ravines. Visitors soon realise that the emphasis is on accuracy, although the landing areas are generous enough to accommodate all but the most errant shots. Bob Hunt, who also designed the links course at Tobago Plantations, home of the annual Tobago Plantations Seniors Classic on the European Seniors Tour, has created a host of memorable holes, none more so than the 198-yard par-3 6th and the short 330-yard par-4 11th where the view behind the green simply takes the breath away. The 6th, which is destined to become the course’s signature hole, requires both accuracy and careful club selection. The tee shot has to cross a deep ravine to reach a two-tier green cut into the foot of a hillside. 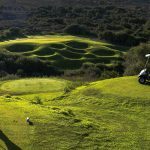 A three will always be welcome, particularly as the 7th, a demanding, uphill 407-yard par-4, requires what is probably the hardest drive of the day. 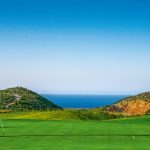 All around the course, the golfer can enjoy stunning views, both of the mountains and the coastline some ten minutes drive away. It is a stunning backdrop to what will be a memorable day. 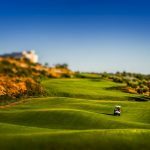 Above you can see few photos taken by the club itself covering the 18th hole, the championship 7th tee and the signature tee of the 6th. 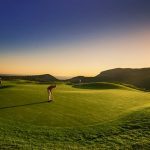 You can also see the amazing facilities the clubhouse has to offer, including pro shop, cafe, terraced restaurant, driving range and the golfing academy. 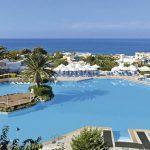 If your thinking of booking a holiday to play golf in Crete, then make sure you choose a partner hotel which offer discounted green fees and low priced transfers direct to the golf course.The best area to take a holiday if your looking to play golf in Crete quite often is Hersonissos, it means that travelling to the golf course will take you a matter of minutes rather than transfer times of an hour or so.